Predecessors of the storied Navy SEALs got the nickname ‘frogmen,’ because of early dry suits first used in the Korean War. 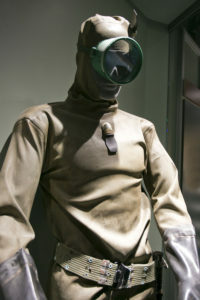 This early dry suit is on display at the National Navy UDT-SEAL Museum’s Cold War Gallery. trained for the Naval Combat Demolition Units, the forerunner of the Underwater Demolition teams.